Brains of newborn human babies and Neanderthals, who became extinct about 28,000 years ago, were about the same size and appear almost identical at first, said the research which appeared in the journal Current Biology. But after birth and particularly during the first year of life the differences in development are stark, said lead author Phillipp Gunz of the Max Planck Institute for Evolutionary Anthropology in Germany. "There was a huge difference in the way they grew their brain compared to modern humans in the first one-and-a-half and two years," Gunz said. These new findings shed light on how our closest extinct relatives might have thought differently than us, and reveal details about the evolution of our brain. To compare the two brains, scientists assembled a virtual Neanderthal brain by scanning skull fragments and comparing the computer models at different stages of growth to the human baby brain. The human brain began much more activity in neural circuitry in the first year of life, which may have helped early homo sapiens survive in the process of natural selection, the study said. The brains of adult Neanderthals were a different shape than ours — theirs were less globular and more elongated, which was the norm for more than 2 million years of human evolution, and is seen in chimpanzees as well. "The interesting thing is within modern humans, the size of the brain correlates only very weakly with any measure of intelligence," he said. "It's more the internal structure of the brain that is important. "And the Neanderthal, they were smart because they had a huge brain, but we think that internal structures must have been different because they grew differently, so we don't think the Neanderthal saw the world as we do. 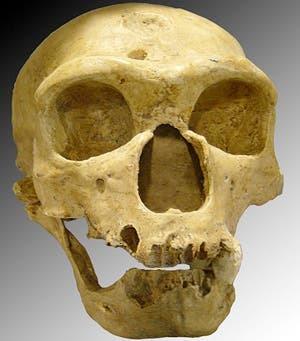 Neanderthals are believed to be modern humans' closest ancestor, and some scientists view both as the same species. In May a landmark genome analysis determined that humans most likely interbred with Neanderthals, and that as much as 4% of the modern human genome seems to be from Neanderthals.